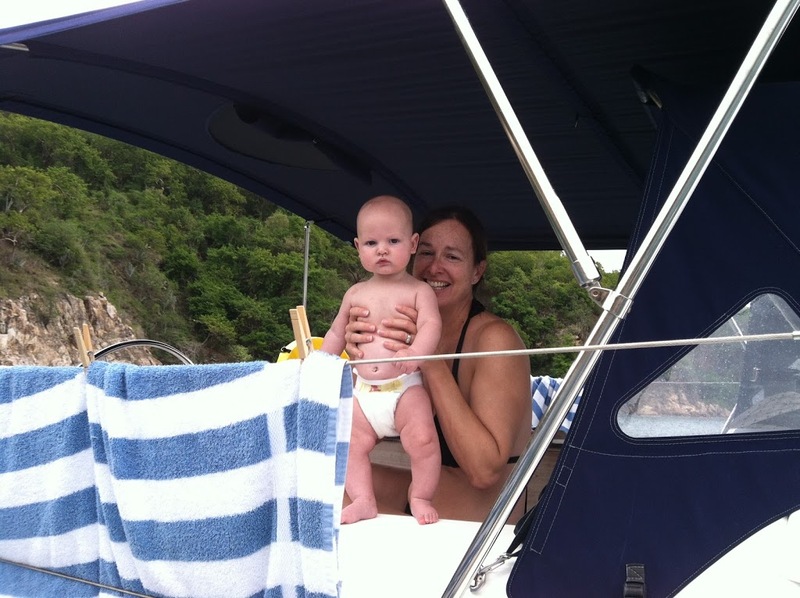 Many of the important events Caroline and I have shared invariably occur on a sailboat. Our first date involved a nearly blind, navigation-electronics-less cruise through black-bean-soup fog. I was terrified (but apparently hid it well), and she was somehow smitten with my dead reckoning. Later, my persistent, puppy-dog wooing involved numerous harbor cruises, overnighters, and week-long charters. The Admiral in his Admiral’s seat. 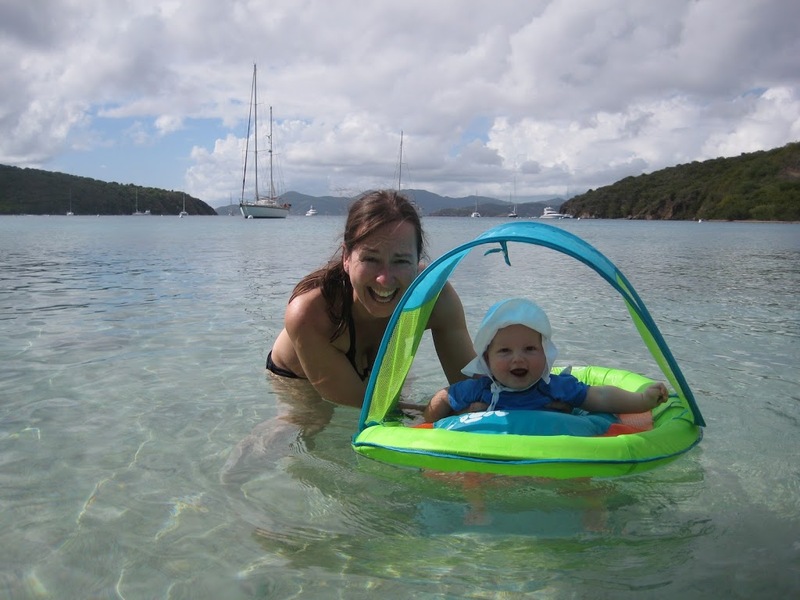 Naively, I really wasn’t too worried about how we’d do on the boat, but I was worried about flying with a six-month-old, and our incredibly large pile of baby stuff (cribs, seats, toys, strollers, etc.) 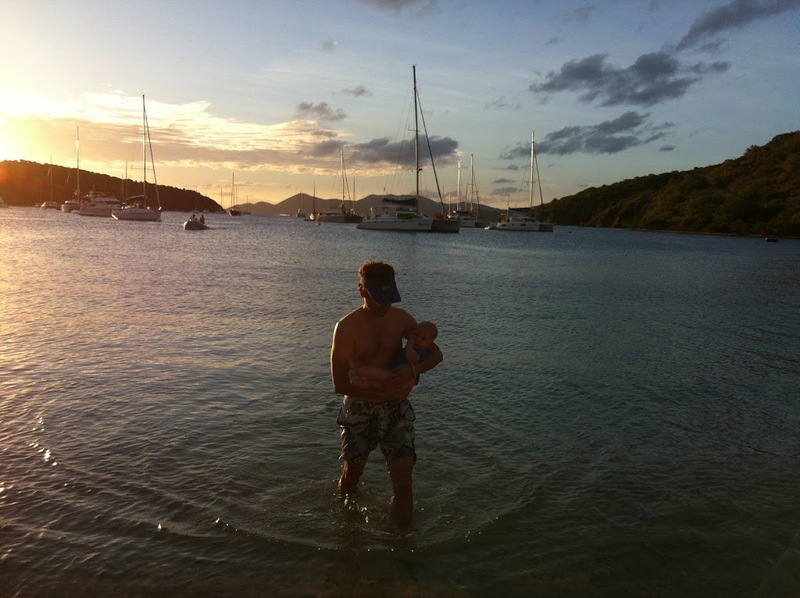 from our home in Boston down to the MarineMax charter base in Tortola, BVI. But as we learned almost immediately, you encounter a certain warmness when you fly with a baby that doesn’t cry too much. Our extremely cute, extremely bald little distraction seemed to soften the moods of all of our fellow high-season travelers—even Glenn Close, the actress. 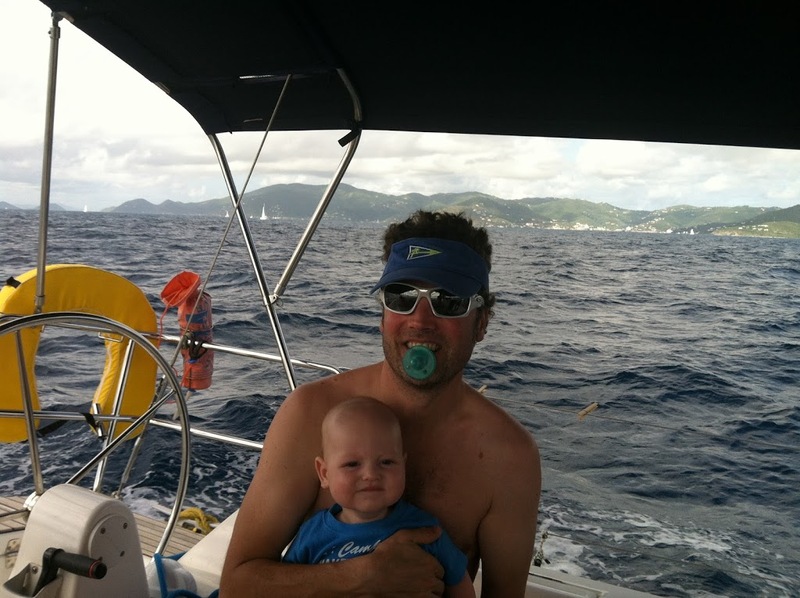 The little one actually dropped his pacifier and drooled on her as we paced the aisle of our Virgin Islands-bound plane, and she couldn’t have been nicer. Same holds true for the customs man in Tortola. Just one look at our little man’s passport photo could melt the heart of even the most jaded government official. Even still, finally arriving at the charter base felt like a victory, and we were grateful to see Marine Max’s manager Bentley Hodge had stayed late to welcome us with open arms. 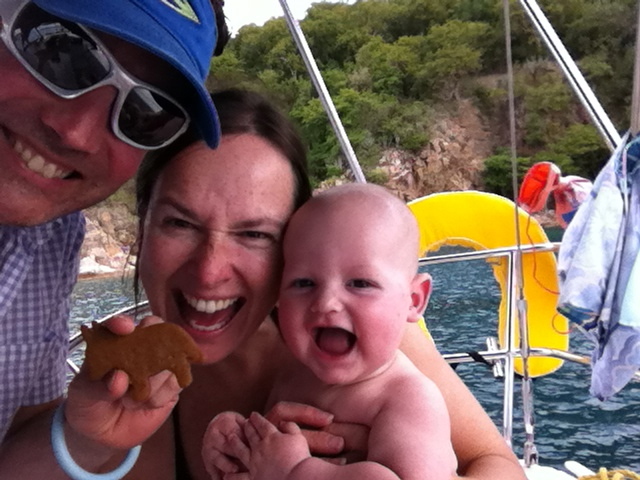 The reality of how different chartering with a baby was going to be really sunk in when we got up the next morning. When it was just the two of us, we’d race to get off the dock and be swimming in a peaceful anchorage as quickly as possible. But as all parents know, there’s no racing with a baby. 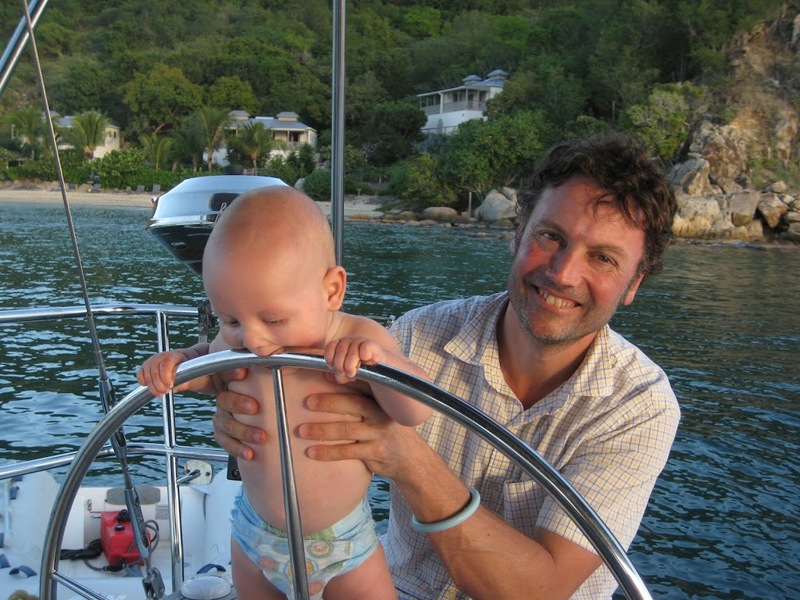 The time and energy required for feeding, naptime, and just living with a baby on a boat added to normal charter chores, like provisioning, slowed us down a bit. Making sure the boy was well cared for was obviously way more important than if we “wasted” our precious charter time at the dock. Everything took longer than expected but it was actually quite liberating to really slow down. We eventually nosed our extremely well-equipped Marine Max 413s, built by Dufour, out of the marina and set a course for Cooper Island a full four miles away! 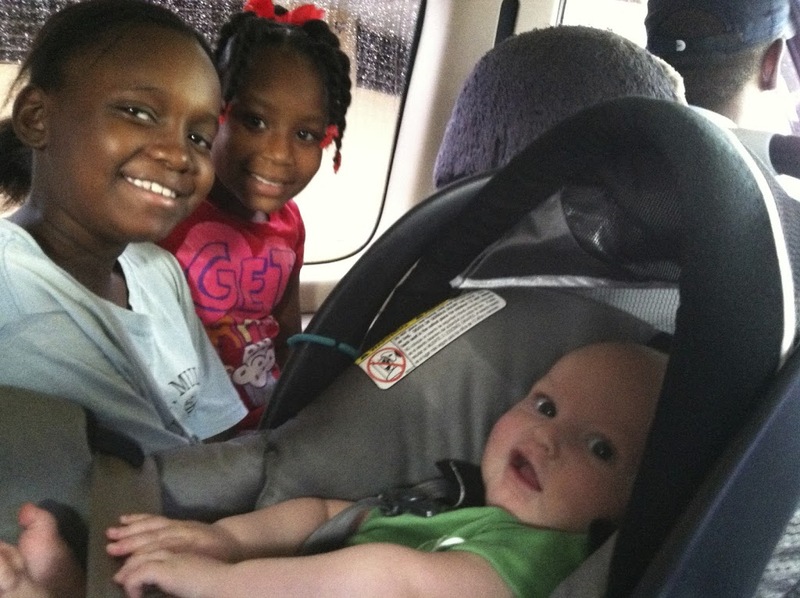 Part of the delay was simply due to figuring out the logistics of keeping a six-month-old baby safe, secure, and out of the sun on a moving, pitching, heeling sailboat in the tropics. Keeping him strapped into his car seat—“The Bucket”—and wedging it into a shady corner of the cockpit sole worked, but I also found that strapping the Bumbo seat on top of the cockpit table provided a much cooler alternative. Just seeing “The Admiral” strapped into his cockpit command seat as we sailed with a bit of jib rolled out over to Cooper Island convinced us that we were going to have a great week. The Admiral may have squirmed and squawked a bit in his admiral’s seat while Caroline eased us up to the mooring ball off Cooper, and I boathooked the rode onboard, but we ended safe and secure on the mooring nonetheless. We settled in for the night, relaxation and gratitude washing over us as the baby slept peacefully in his portable crib in an aft cabin while we enjoyed the stars and the glassy-still anchorage. And then, at around 2330, I awoke to the sound of the rudder making a subtle yet strange noise. What I found when I nonchalantly poked my head up the companionway took my breath away—we were on the beach. My mind raced, “How could this have happened? I’ve foolishly put my family in danger!” before I took a deep breath and went into full “Keep Cool” mode. Thankfully Caroline knew my somber deep breath meant something was up, but she is good in a crisis too. She made sure the baby was safe and ready to get off the boat in a flash, and as we learned later, it actually wasn’t too bad, all things considered. Turns out the entire mooring screw (of which we happily paid the $30 fee to the mooring’s “owner” the night before) had pulled out of the bottom for apparently no reason. But the wind and swell were thankfully light. Not only were we able to contact Bentley on the phone, he was kind enough to leave his warm bed to come out and pull us off with his powerful work boat. He also stayed with us as we motored back to the marina so we could have the boat checked for damage in the morning. In all of our years chartering, we’d never, ever, called a charter base with a problem, and I hope I never have to again, but I could not be more impressed with, and grateful for, Bentley and his team. They literally saved our trip. “How far is that exactly?” asked Caroline. “Hmmmm. Twenty miles or so…upwind,” I replied. 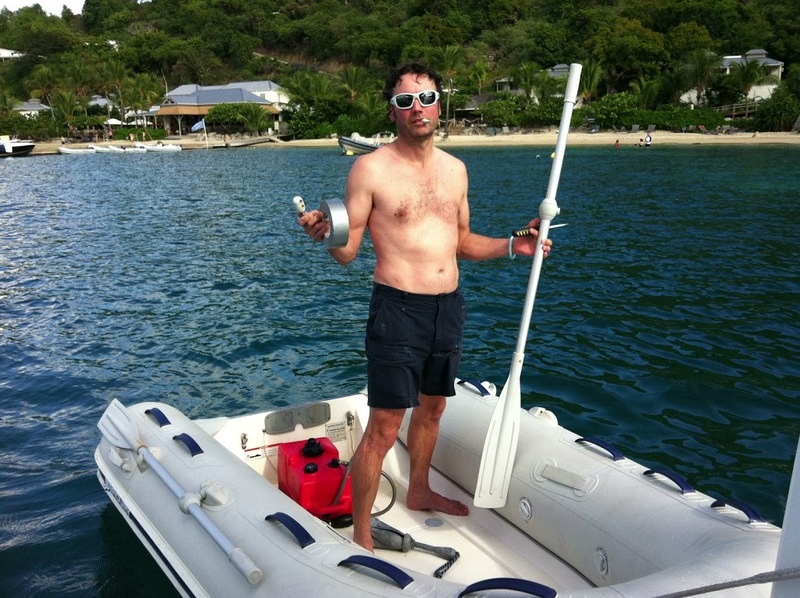 Caroline and I have punched into the trades up to the Bitter End YC from Tortola many times before. “Do you think the Pickle is up to that?” she asked. “You’re probably right. Let’s just get off the dock and see.” I had a feeling we weren’t going to Virgin Gorda almost as soon as we’d unrolled a bit of jib and were beam reaching out of the channel. There was some sting in the northeast trades. The boy was crying. The leeward jib sheet was flogging, and the apparent wind felt like it was howling. So our vision of celebrating Christmas and enjoying all the land-based comforts of the Bitter End Yacht Club shifted to spending the holiday moored in the more private and rugged beauty of Kelly Cove off Norman Island. And we knew we made the right move as soon as we fell off the breeze and started making the easy run down the Channel. The wind quieted down. The boat flattened out. 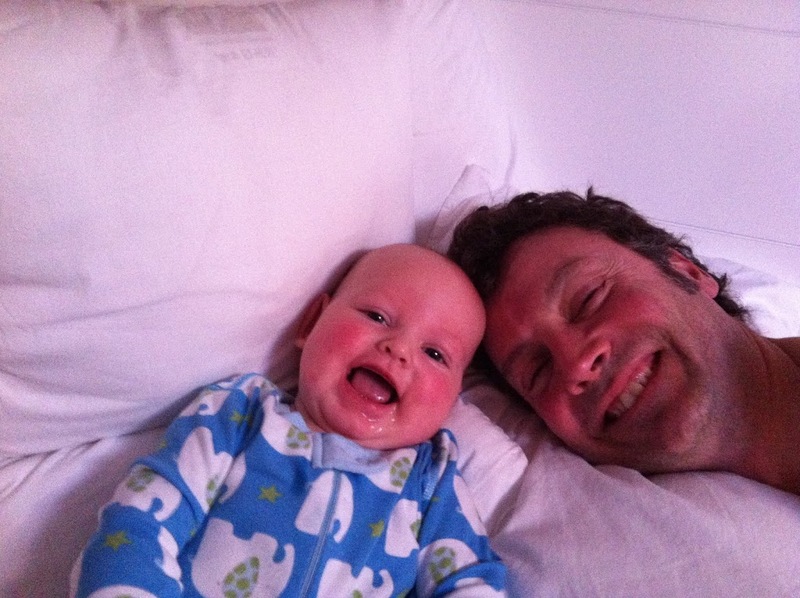 The Pickle stopped fussing, and Caroline and I breathed a bit easier as we literally went with the flow. It’d been quite a trip already. Any disappointment we might have felt for not pushing up to Gorda Sound dissolved as soon as we grabbed one of the four moorings in Kelly Cove. It’s a gorgeous spot and we arrived with plenty of time to take a refreshing dip off the stern, have a nice mellow lunch, and much more importantly, set the boy up to have a honest-to-goodness nap. Peace at last! Calm and quiet, Kelly Cove was in fact the perfect spot to celebrate Christmas. The boy woke from his nap both rested and curious to explore his surroundings. We turned the salon into the “play zone” by putting the table down so he could have a large cushioned area to play with his large assortment of toys we brought from home. We played a little Mozart on the stereo and watched the uncharacteristically cloudy sky explode with color as the sun went down. And best of all, the boy was able to have his tub before bed just like he does at home. 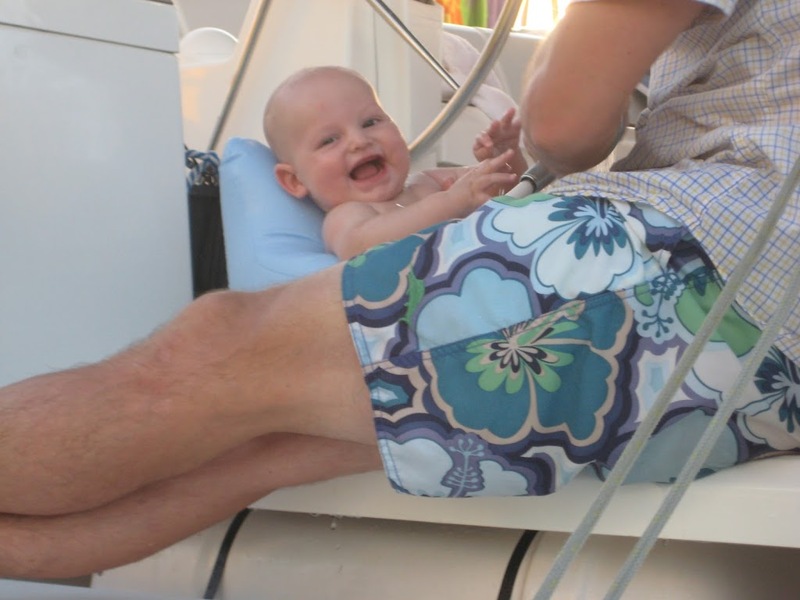 Prior to this trip, Caroline was an absolute genius when it came to finding the stuff we needed to make the boy feel as comfortable as possible on a boat in the tropics. 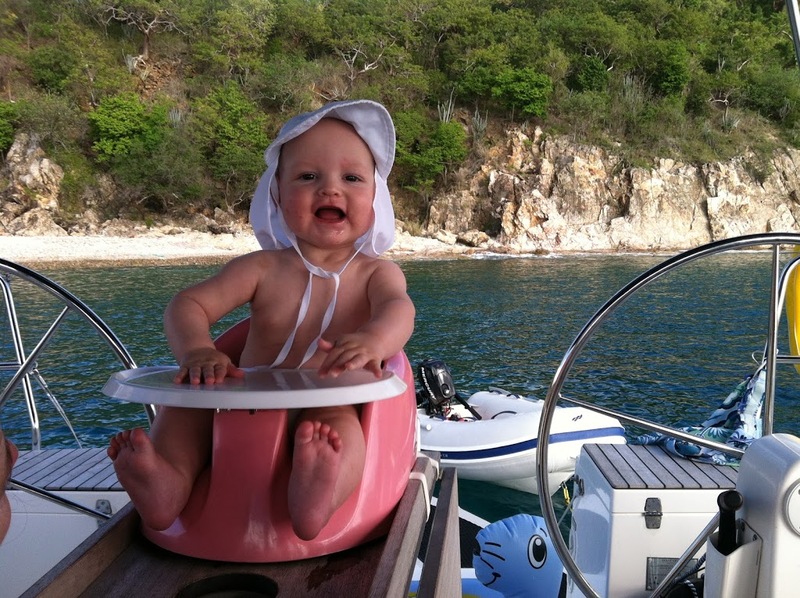 She got it all: sun hats, sun block, sun tents, floating toys, a life jacket, even cute little sunglasses, but the absolute best purchase she made, and what we’d unequivocally encourage any new parents daring enough to charter with an infant to bring was…the inflatable tub! The picture really does say it all. I mean, come on, how cute is that! Mr. Splishy loved it. He had saltwater to cool down with and fresh water to clean up with before bed. Talk about portable plunge pool! It was a guaranteed hit every time. Christmas morning in the Caribbean is every bit as wonderful as it sounds. We awoke safely, peacefully attached to a secure mooring with no agenda other than to keep unwinding and keep the boy entertained. 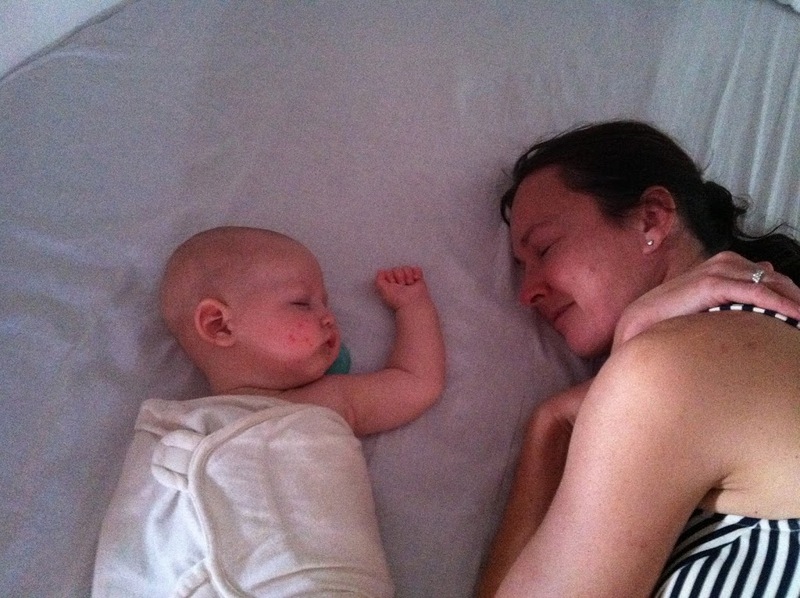 As any new parent knows, that kind of a day is a rare gift, and we had several in Kelly Cove. 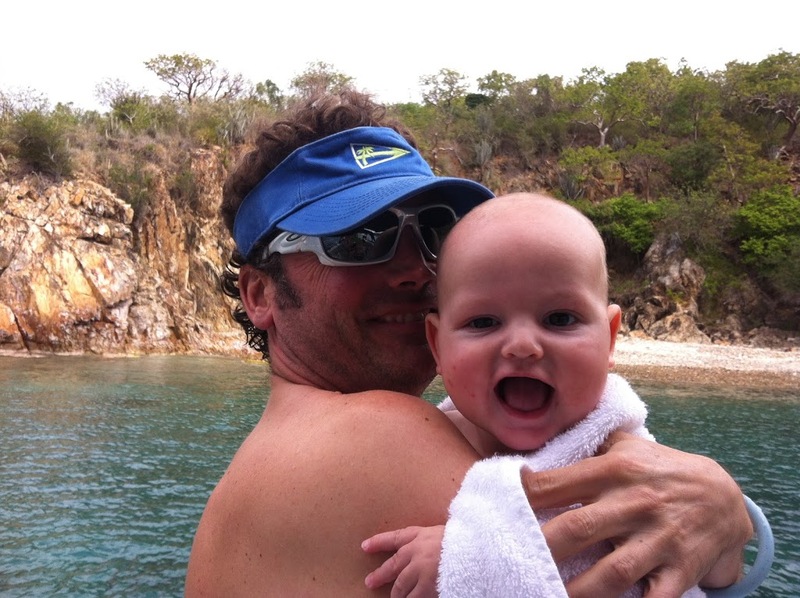 We swam, and snorkeled, and cooked like we’ve always done on a charter, but now we had to take turns while we also rocked, soothed, changed, fed, and bathed the little one. We found everything wasn’t necessarily harder with the boy, we just adjusted to his rhythm. It was actually pretty enlightening, but we did get a bit claustrophobic if we didn’t make regular trips into the beach at the nicely updated Pirates Bight Bar and Restaurant. 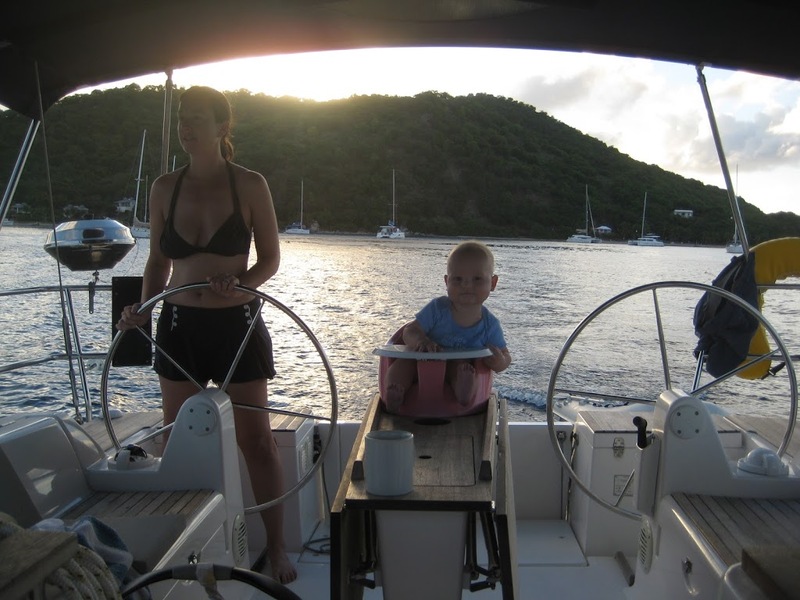 Sailing with a baby definitely opened our eyes to the beauty and relaxation of staying put for a few days, but we’d lost some charter time due to the “mooring incident,” so we had to start thinking about heading back sooner than we’d have liked. And since Cooper Island was the logical stop that would put us within shouting distance of the marina for our last night out, we grudgingly agreed that going back made sense even though we both felt a little funny about it. Caroline soon put it all in perspective. “I want my money back for that defective mooring,” she said with a grin. I couldn’t have agreed more. We set off on the arduous nine-mile passage up to Cooper after a lazy breakfast the next morning. What a difference a few peaceful days on a mooring can make. Feeling much less frazzled and much more confident that we weren’t going to run aground, or drop the baby overboard, or be forced to battle the elements, we enjoyed an invigorating sail up the Channel. And learning from the wily ways of veteran parents, we timed our passage to perfectly coincide with the boy’s morning nap and covered the bulk of the miles while he was literally sleeping like a baby. We agreed all of it—the lugging the stuff, the responsibility, the expense, the sleep deprivation—was worth it. We talked of other trips we’re going to do with the little one, and had a laugh at all the things that had gone “wrong” on this one. In addition to the “mooring incident,” we also ran out of propane (again to be “saved” by the truly awesome and understanding Marine Max staff who ran a replacement bottle out to us), and we even ran out of cash to pay our mooring fees. Thankfully, I was able to get some cash from the infamous Willy T boat bar over in Norman—but that’s another story for another story. “Nothing else could possibly happen,” I joked. And then I looked aft and saw the hideous sight of our dinghy happily tugging on its painter without an engine on the transom. I’m totally serious. It was just like that. My heart sank as fast as that outboard must have. Ahhhhhhhh! I think my scream woke up napping babies on land. And there simply was nothing to be done but accept the shame of it. I’d become one of the endless progression of gobs who’d unwittingly allowed an outboard to end up at the bottom of Sir Francis Drake Channel. Sometimes Murphy strikes with a vengeance. So, we simply picked a mooring as close to the Cooper Island Beach Club as possible so our row into shore wouldn’t be too hard. The row to shore was more annoying than hard but that really didn’t matter. We had cold drinks in the shade and the cutest, baldest baby in the world continued to bring the warmness out of everyone we met. Caroline found out where our “mooring man” was and I got our money back. He couldn’t have been nicer or more apologetic. “I’m sorry man,” he said. “The screw just pulled out. Here’s your 30 bucks back,” he said as he turned away to blow the smoke from his cigarette away from me. What more can you say really? 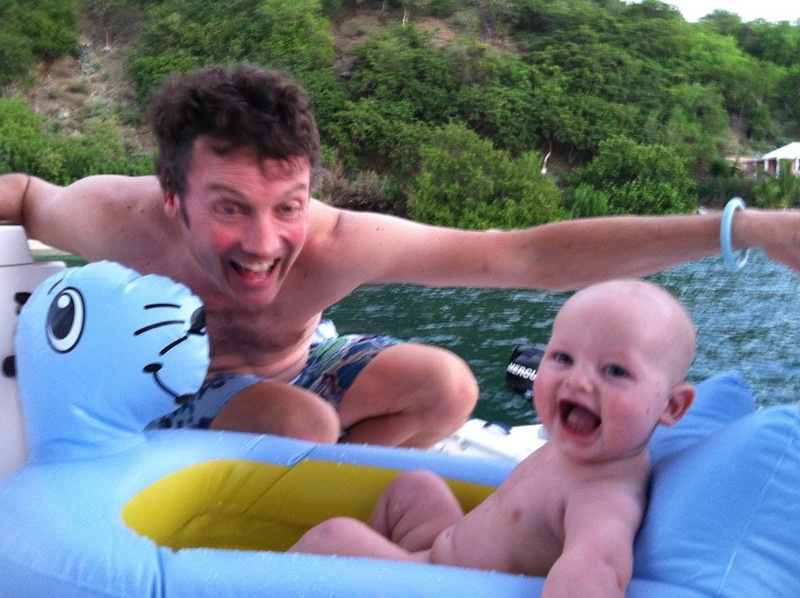 So, when the no-see-ums came out, we made our way back to the only engineless inflatable on the dock, and jerkily rowed our way back to the boat. Then it was time for Mr. Splishy’s bath, and dinner, and the full moonrise, and the welcome oblivion of sleep. But something really beautiful happened the next morning. Instead of being depressed by all the weird bad luck we had on this trip, I saw the beautiful sunrise, smelled my fresh brewed coffee mixed in with the warm, soft, sweet air, and plopped our little bald “Admiral” into his admiral’s seat, and realized how truly lucky we are. Outboard engines are a dime a dozen. But there’s only one Mr. Splishy! My my husband and I are planning on going with the family chartering our own boats with 30 other family members 2/2019. By that time we will have a 6 month old girl (first one) My husband is worried about bringing her. I sent him this article. I was curious, how were feedings, sanitizing bottles and all that other stuff. Thanks Antra! Hope to have a visit soon! I love these photos ! What a great baby boy !!! Thanks Martha! It was as fun to write as it was to do. And the Admiral can’t wait for our next trip! Let’s talk babysitting soon. What a great adventure! Love the pictures. You have a super sweet, delicious little guy!